Well, I pulled out my Martha Stewart Adhesive Stencils yet again! 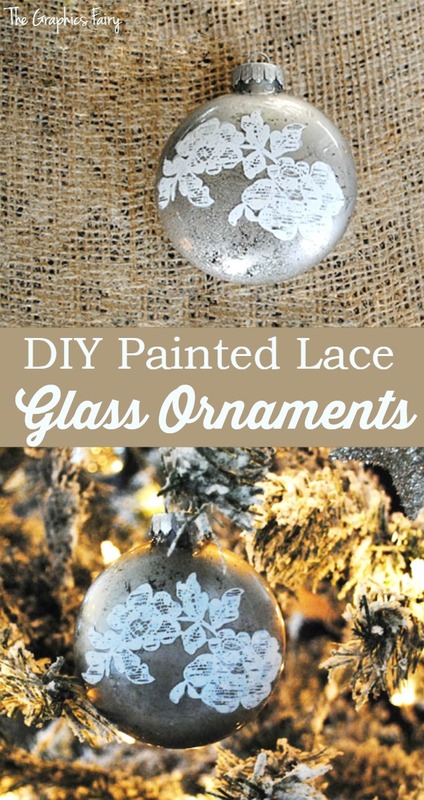 This time I made some lace painted glass ornaments. I just can’t seem to stop using this stuff, it’s so easy and fun! 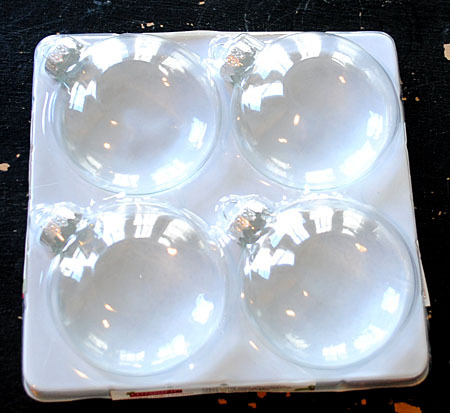 I used these flat glass ball ornaments that I found at Michael’s. 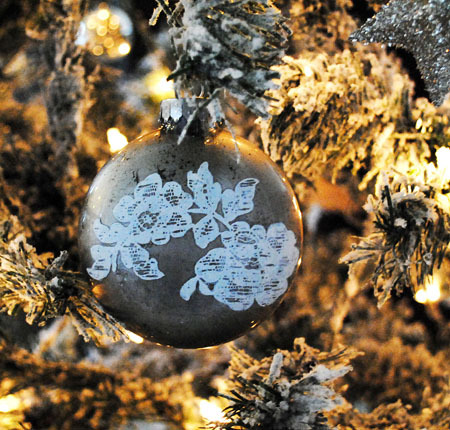 Step 1: Remove the cap and pour some silver paint into the glass ball ornaments. Swirl the paint around to coat the inside of the ornament. You may want to add a couple of drops of water to help move the paint around more freely. I left a few blank spots and poured some glitter in, which give a nice sparkly effect on the bare areas. Allow to dry. 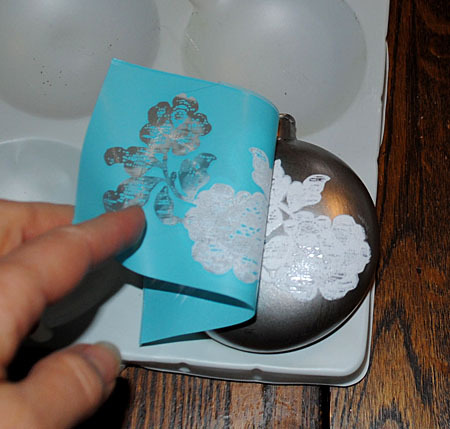 Step 2: Stick the Adhesive Silkscreen to the outside of the ball ornament. Step 3: Using the Foam Pouncer, apply the paint over the silkscreen. I chose this floral lace design, It was too big, so I just painted the portion that fit on the ornament. 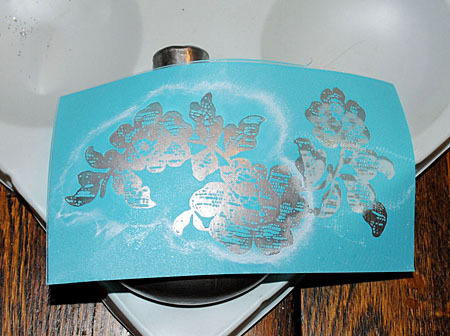 Step 4: While the paint is still wet, carefully peel back the Silkscreen to reveal your design. That’s it! Just make sure you wash your Silkscreen right away, so that you can reuse it again. I love how these look, so delicate and pretty and so easy to make! I really like the way the added glitter kept the paint from sticking perfectly. 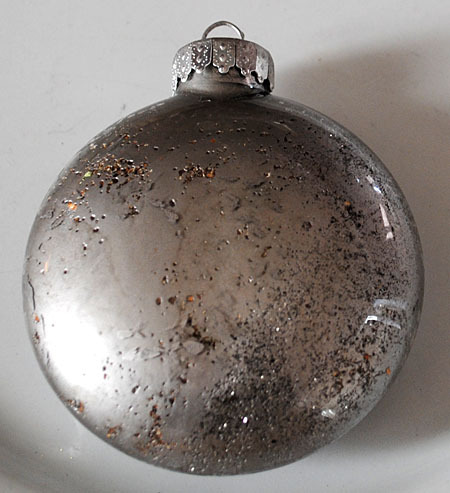 It gave it a lovely time worn look, as if it were an Antique Christmas Ornament passed down through the generations. I hope you liked this Christmas Ornament Craft Tutorial! 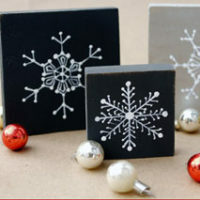 You might also like these Easy DIY Holiday Snowflake Decor Blocks HERE. 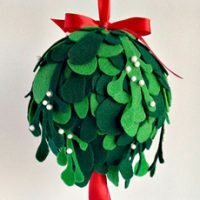 Homemade Christmas Decorations – Snowflake Blocks Make Thanksgiving Napkin Rings with PhotoFabric Make a Felt Kissing Ball – Mistletoe! I love how these look very old. Just gorgeous. Nancy, These are truly my newest favorite thing! 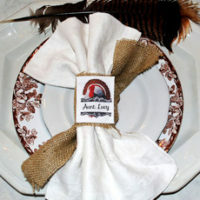 They are not like regular stencils, the details are so intricate it’s amazing! I think you will have fun with these, and there are so many to choose from. I used my Michael’s coupon to save money on them. Thank you Patricia! I hope you have fun with this! I can hardly wait to try this! Thank you so very much!!!!! You are so welcome Jil! Thanks for stopping in and leaving a comment! 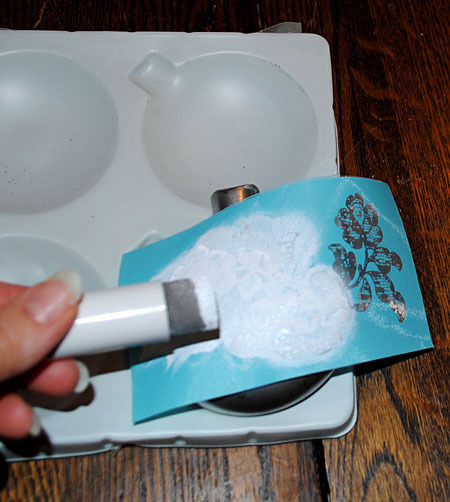 I think the balls were pretty even before you stenciled them–that paint effect is great! These are beautiful. Thanks Shannon and Pat! Yes, it was a happy accident! I’m not sure what made me pour the glitter in, but I liked the effect too! Pat, They are very easy to work with, they aren’t super sticky, but sticky enough to keep them in place pretty well. I didn’t have to redo any of them, all 4 turned out on the first try. So pretty, Karen! 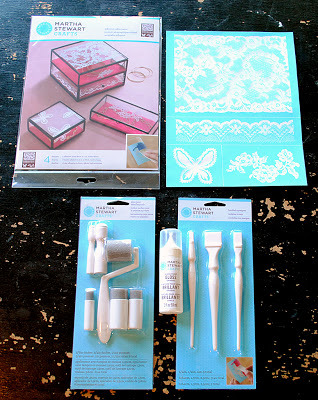 I love the silver & glitter as a backdrop to the lacy stencil. Really lovely! Thanks for sharing this idea. Love the vintage look of the glass ornaments with the paint. Thanks for sharing this technique. I might have some of the tools needed already so I don’t have to make Michaels and Martha Stewart richer. I do have to agree that her products are superior to many others I’ve tried. The look of the glass is gorgeous without the lace but with it, superior and splendid. Thinking of other objects I could use that technique on. As always you’ve done beautifully. What would we do without you Karen and Gina? Sure hope we don’t ever have to find out. This is simply gorgeous. It has that shabby sort of mercury glass look about it. Beautiful!!! Thank you for all yours shares … Your blog is a “réelle source d’inspirations” ! These are just gorgeous! I love them. thank you so much for sharing!